This is a recipe my aunt made in the 30’s. A meringue cookie with coconut and cornflake cereal. I could never eat enough of them. In a large glass or metal bowl, whip egg whites to stiff peaks. Stir in white sugar. 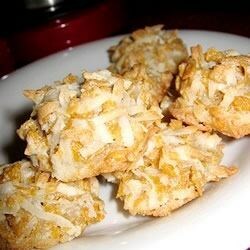 Fold in coconut and cornflakes. Drop by teaspoonfuls onto the prepared cookie sheets. Bake for 18 minutes in the preheated oven, or until coconut is golden.